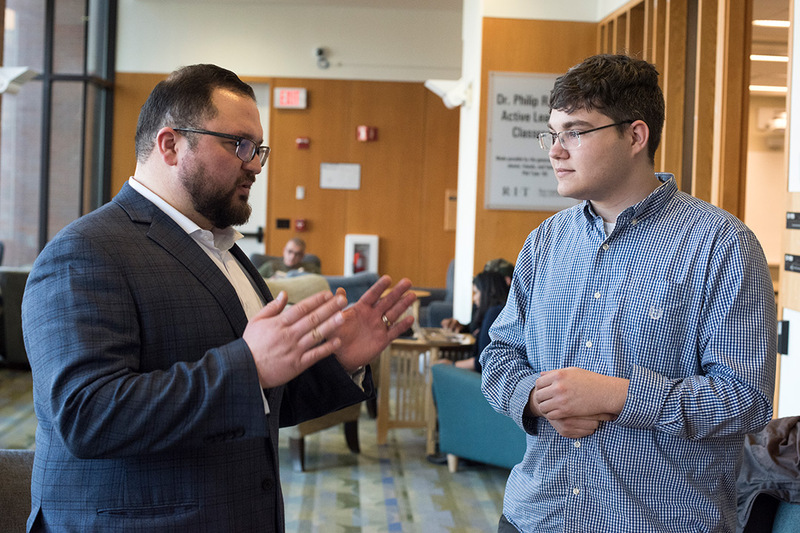 Steven Carnovale, assistant professor of supply chain management in RIT’s Saunders College of Business, left, talks with third-year student Nikolas Kelly following one of his classes. Rochester Institute of Technology student Nikolas Kelly is thrilled by efficiency, order, logistics and streamlining. So, it’s no surprise that he found his niche studying supply chain management in RIT’s Saunders College of Business, which he says will lead to his dream job as a supply chain analyst. The interdisciplinary bachelor’s degree program in supply chain management, which launched this fall and includes courses from RIT’s Kate Gleason College of Engineering, focuses on the coordination of processes required within a business, as well as across businesses and suppliers, to deliver products and services efficiently—with an end result of maximizing customer value and firm profitability. The program provides students with expertise in business strategy, information systems, lean/quality management, inventory management, logistics and project management—all essential functions for an effective supply chain. Students also take courses in accounting, finance, international business, statistics and marketing, earn Lean Six-Sigma Yellow Belt certification, and are required to complete a co-op assignment. According to Steven Carnovale, assistant professor of supply chain management in Saunders College of Business, the concept of supply chain management has existed for centuries, since before ancient Egyptians stockpiled grains to hedge for a potential drought. Today, Carnovale says that supply chain management degree offerings—and related careers within industry—have skyrocketed due to the globalization of business. The U.S. Department of Labor’s Occupational Outlook Handbook forecasts above average job growth for this industry over the next decade. Traditionally, jobs including warehouse managers, operations managers or procurement specialists have handled their parts of the chain separately. But, with integrated degrees like the one offered through Saunders College of Business becoming more popular, these jobs are being combined into one analyst who is well versed in all of these areas. Carnovale goes on to explain that supply chains are often the primary value-generating process for companies, and graduates from supply chain management degree programs enter the workforce as value creators—invaluable to company CEOs, financial bottom lines and consumers, alike. Kelly, a third-year student from Kansas City, Mo., has already put his supply chain knowledge to good use. During a brief stint as a corporate intern, he was part of a team tasked with reviewing $17.5 million of inventory. The team identified $2.1 million of customized parts that were never used—essentially wasted inventory. Strategies were then implemented to alleviate useless inventory in the future. There are currently 22 students enrolled in the supply chain management program, which includes 12 students minoring in the discipline. Applications are being accepted for future cohorts.